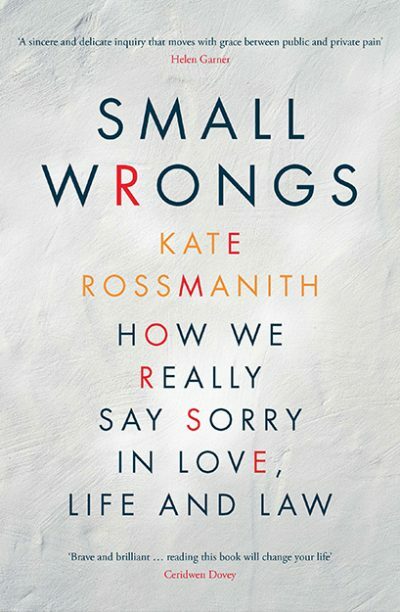 Part memoir, part cultural study, Small Wrongs is a unique look into the role remorse plays in both public and private spheres. With the observational spirit of Helen Garner and a florid turn of phrase, Kate Rossmanith weaves research and personal experience together to create a patchwork of a marriage in trouble, a difficult father-daughter relationship and a precarious justice system that must juggle legal, moral and emotional responsibilities and prejudices. She also asks: when is remorse genuine, and when is it performed as a means to an end? At times it feels like a false equivalency to equate matters of the state (including serious crimes) with matters of the home—each narrative has enough meat to warrant an uninterrupted investigation without the distraction of the other, and the point sometimes meanders. Yet Rossmanith is a compelling narrator, keeping the reader engaged and offering tantalising cliffhangers. Fans of Garner and Vivian Gornick will enjoy the exploration of inner life, while those interested in the nuances of Australia’s court system, and its ultimate fallibility, will be fascinated by Rossmanith’s original research and interviews.